“Add just a pinch of salt for taste” is often quoted in recipes- this pinch of salt has the ability to bring out the taste in a dish. However, there are many rock salt benefits to show that our salt can be way more than taste boosters. From a health point of view, it is very important to have salt and even more important to have the right amount of salt. which can also be harmful causing a number of side effects such as a headache, confusion or altered mental state, seizures as well as decreased consciousness and much more. That is why it is very important to have a balanced salt intake. But the question is, which types of salts are healthy? Usually, the salt chosen depends on the tastes, nutritional status and diet. If a person is eating iodine-rich foods, regularly then he/she can choose sea salts/ rock salts for their beautiful array of colours, textures and flavours. But, if a person is pregnant, hypothyroid or deficient in iodine, then he/she has to choose table salt fortified with iodine. Most of us aren’t even aware of the types of salt or simply rock salt for that matter. Don’t worry, we are here to the rescue. 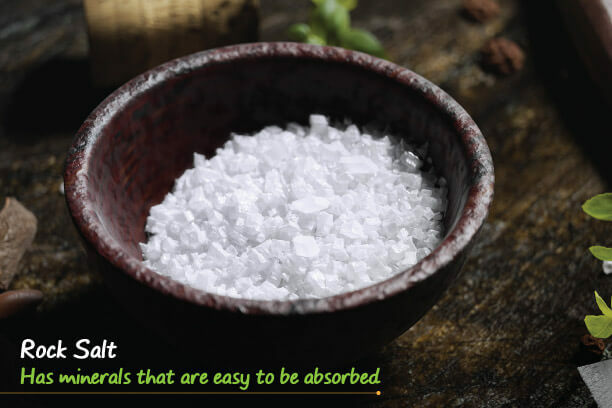 But before jumping right into the Himalayan rock salt benefits or the demerits of iodized salt that we commonly use, let us know about the history of rock salt. The Himalayan salt aka halite hails from the Punjab region of Pakistan. The region is almost 190 miles from the Himalayas. The crystals of Himalayan salt are in their purest forms because the area where they are seen as not only one of the richest salt areas in the world but also they are believed to be composed of remnants of the original primal sea. This rock salt is formed with an overlying pressure, lying under about 5,000 feet of Himalayan ranges. The rock salt crystals hence formed, are the purest with all the natural minerals remaining intact. Himalayan rock salt is blessed with 84 minerals which also include important trace elements that are not found in normal food sources. On spectral analysis of Himalayan salt, it is found to contain macro minerals, such as iodine, sodium, calcium, phosphorus, and chloride, and trace minerals like iron, zinc, boron, magnesium, as well as gold, silver, arsenic, nickel etc. The importance of trace elements is that although they are required in small amounts their absence can lead to deficiency diseases. Also, trace elements are required for many bodily functions like enzymatic actions. Apart from these mineral sources Himalayan salt also contains minerals that are toxic in huge quantities such as lead and plutonium, but in trace amounts, these are safe and even beneficial. American Heart Association (AHA): 1500 mg (2). Read to know: how Much of Salt or Sodium is Required in a Day! Below are the different benefits of rock salt in terms of its constituent and processing. These points are somewhat useful to make the right choice regarding the type of salt we use. First of all, the common iodized salt is formed after undergoing heavy refining processes. In order to make the salt “look good”, it is mechanically processed to be finer and whiter. This makes it lose all the mineral content. Whereas, rock salt is naturally crystallized and then mined, which retains its mineral richness. The result is, we don’t get salt but also a natural source of important as well as trace minerals. Common salt has bleaching agents as well as anti-caking agents. Whereas, the Himalayan rock salt is devoid of any of these. The anti caking agent brings side-effects like constipation as well as kidney issues. 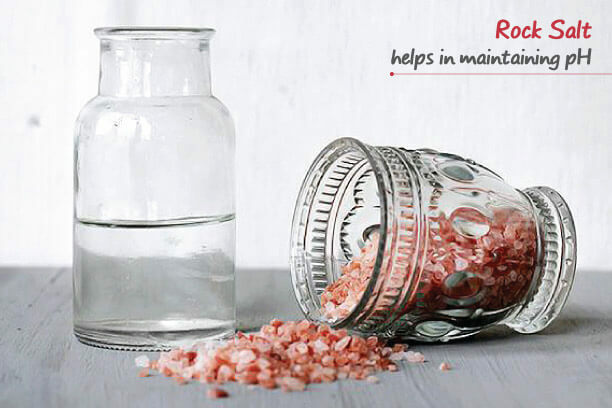 While the common refined salt is stripped off all the important minerals, the Himalayan rock salt retains all its minerals as well as important electrolytes. It contains 6 electrolytes sodium, potassium, chloride, magnesium, phosphorus and calcium. a] Controlling the stability in the cell membranes. b] Maintaining coordination among different cells in the body. c] Carrying electrical impulses between nerve cells. The crystalline nature of rock salt ensures that the mineral content is virgin and not affected. Moreover, these crystalline salt have the energy content of the minerals in a balanced form which makes it easily metabolized by the body. However, this crystalline nature isn’t found in the common refined salt. c] The salt is crystalline in nature. For common use, you will get a somewhat finer version too. If we go through the pages of history, we can see that people in the earlier times used rock salt without showing any major health concern because of the salt. Therefore, this is a strong indication that it can be an easy and healthy replacement of our commonly used refined salt. Are you still wondering if you should take up the Himalayan rock salt as your household salt? Rock salt is found to be helpful in promoting digestion as well as improving loss of appetite. Due to its trace elements, rock salt helps in boosting body’s metabolism. This further improves different body functions as well as the immune system of the body. Rock salt is found to be useful in curing problems like rheumatic pain, inflammation, arthritis. Having one spoon of rock salt along with water can be useful in fighting muscle cramps. Rock salt lamps are used as air purifiers. These Himalayan rock salt lamps have bulbs inside them. The lamps emit negative ions that clear the harmful ions present in the air. This improves breathing and respiratory ailments. It is found that rock salt has the ability to stimulate insulin in the body that prevents sugar cravings. This can be a help for losing weight. Elements found in Himalayan salt in addition to sodium and chloride. We intake salt not just as an external source. Salt is found in many food products, especially in the processed foods. That is why we should at least replace the common salt we use as a table salt or in cooking with Himalayan rock salt. After all, why not add the naturally occurring high mineral content rock salt instead of the refined unhealthy one?